Medical sales careers are highly sought after, but not all medical sales jobs are created equal. The MedReps Best Places to Work Awards began in 2011 as a way of identifying which medical sales companies were the best employers. Today, the survey continues to give medical sales professionals a way to evaluate current and prospective employers and collectively decide which companies are the best places to work. 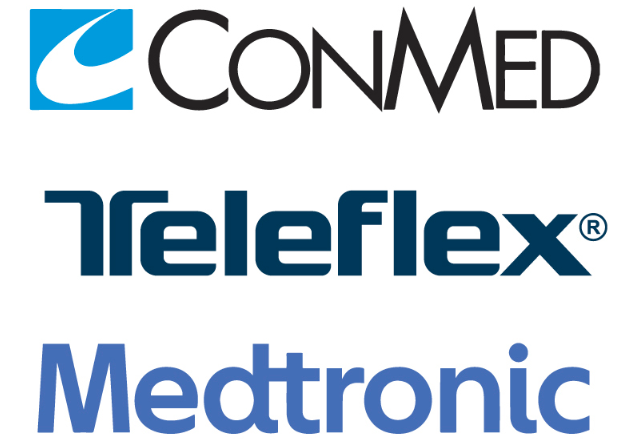 This year, CONMED, Teleflex, and Medtronic came out on top. Keep reading to learn more about the winners and discover why the medical sales community thinks so highly of them. We’ll also look at overall job satisfaction in medical sales. In October of 2018, we invited the MedReps community to take a survey telling us what they value in an employer and where they’d most like to work. Over 800 medical sales professionals responded. Most respondents (81 percent) are currently employed. The most common jobs held by respondents are in field sales or sales management. Respondents can (and often do) vote for their current employers. In fact, 64 percent of respondents told us their current employers should win. Those not voting for their employers (as well as those not currently employed) were asked to cast a vote based on where they would most like to work. Respondents could submit a vote for any medical sales company or choose from a list of Global and Fortune 500 companies, previous Best Places to Work winners, and companies nominated by the MedReps community. In addition to recognizing the three companies with the most votes overall, we’ve also named winners by size and product category. See the full list of winners to the left. CONMED and Teleflex earned the top two spots for the second year in a row. Both companies had the majority of votes come from their own employees. This speaks volumes about corporate culture and employee satisfaction at CONMED and Teleflex. 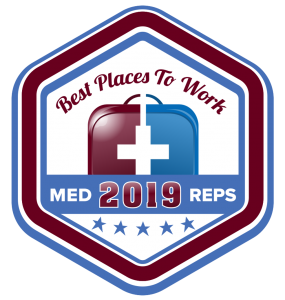 Medtronic is also no stranger to the MedReps’ Best Places to Work Awards. Like CONMED and Teleflex, Medtronic had votes from current employees, but the company drew most of its votes from hopeful candidates. These votes reflect strong employer branding and positive word of mouth about Medtronic. When you treat your sales team well, word clearly gets around. The top 3 winners are all device companies — this is not surprising since the majority of respondents (72 percent) prefer to work in this field. A positive corporate culture was the topmost response selected when asked why a specific company should be named the best place to work. The strength of a company’s products was cited second most often. Medical sales professionals want to work in a positive climate, selling products that are both in-demand and making a difference in the lives of patients. Both of these answers — ”positive corporate culture” and “strong products” — suggest that the Best Place to Work winners are focused on people. The best companies prioritize building a strong corporate culture for its own employees and stress the importance of solid products for its customers and their patients. Other answers follow a similar trend. Respondents overwhelmingly said the most important qualities in an employer are a solid product line (41 percent) and a focus on innovation (33 percent). As it relates to corporate values and culture, respondents prioritize companies that encourage work-life balance (82 percent) and focus on team building and collaboration (54 percent). How Much Do Medical Sales Salaries Matter? Only 9 percent of respondents tied their Best Place to Work vote to the compensation offered by their preferred company. So it seems that while medical sales salaries may be part of what attracts candidates to the industry, money is not the deciding factor when evaluating employers. However, this certainly doesn’t mean that compensation doesn’t matter. When asked about employee recognition and growth, 84 percent of respondents ranked competitive compensation as the most important. These numbers suggest medical sales professionals expect competitive compensation from their employers and employers deliver. It is not seen as a “perk” from a select few high-paying companies. Competitive pay is an industry standard. Companies may tout the right values and make claims about its culture, but at the end of the day, the people you work with are a huge factor in how you feel about your company. So what qualities do medical sales professionals want in their leaders and teammates? Trustworthiness is also an important characteristic in team members (49 percent place it in their top two), but even more important for team members is being “supportive/willing to help others” (56 percent). Despite the fact that medical sales reps often work alone, they value and rely on team members for support, assistance, and encouragement. Employed respondents are overwhelmingly satisfied with their jobs. In fact, 80 percent of employed respondents report being very (58 percent) or somewhat (22 percent) satisfied in their current position. This is up from 76 percent satisfaction in last year’s survey. Despite high satisfaction, 52 percent of those respondents who are employed are currently looking for a new job. That means a third of those who said they are satisfied with their jobs are looking for something else. Another 34 percent say they are very or somewhat likely to leave their job in the next year. So it seems that many of those who are happy at work believe the grass may be greener elsewhere. As with most jobs, there are pros and cons that come with the work. This year, the most common answers to “What is the best part of your job?” included “making a difference” (30 percent), “opportunity for growth” (26 percent), “autonomy/flexibility” (24 percent), “work-life balance” (23 percent), and “products” (18 percent). In past years, ‘the people’ has been a common response to this question. From peers and co-workers to healthcare providers and patients, interacting with great people has been noted as one of the best parts of working in medical sales. Based on answers to other questions in this year’s survey, people are still clearly important, but references to people are notably absent from this year’s top 5. This could be due to reps spending less time with customers and having fewer face-to-face meetings with managers and peers. If medical sales reps are not forming the same kind of relationships with peers and customers as they have in the past, this is likely to negatively impact job satisfaction in the long-term. While satisfaction remains high year after year, respondents still have complaints about their jobs: “stress/pressure” (25 percent), “administrative work” (21 percent), “time in car” (16 percent), and “gaining access to customers” (15 percent). Interestingly, while money was not in the top 5 things to love about medical sales jobs, it was mentioned by 15 percent of respondents as one of the worst parts of their jobs. Medical sales careers have their highs and lows, but overall, professionals are satisfied with their jobs and their employers. Medical sales professionals want to sell in-demand products that make a difference in the lives of patients. Sales reps are willing to work hard, but they want to work for companies that encourage work-life balance. Companies like CONMED, Teleflex, and Medtronic are highly sought-after employers due to their positive corporate culture and innovative products. These companies — along with the other winners — are setting the bar high in the areas that matter to medical sales professionals. Click here to view the full Best Places to Work 2019 Infographic.